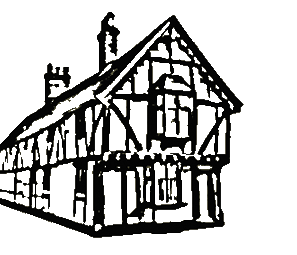 The list vernacular building materials of Surrey and Sussex would not be complete without including brick and stone. Over hundreds of years craftsmen have applied themselves to build homes, civic and industrial buildings boundary walls and decorative structures. The list of applications of stone and brick seems almost endless. Up until the early 20th century most of the brickwork and stone work was bedded in place using a lime mortar, this is softer and more flexible than cement based mortars found today and perfectly suited the often soft bricks and stone used at the time. It saddens us to find wonderful historic masonry painted in modern coatings rendered or repointed in hard cement based mortars. All of these things may have been done with the best of intention at the time but the industry is learning that sometimes the application of these modern materials can harm the very bricks or stone they are trying to enhance or protect. We find that masonry walls covered in cement render or modern paint coverings can provide almost no opportunity for the building to breathe and once damaged can trap water behind them leading to damp penetrating to the inside of the building. On oak framed buildings we often find that timbers have been rendered over and within a decade or so have almost completely decayed away, leaving nothing but historic oak compost behind! and major repairs being needed. Where brick infill panels have been rendered in cement we often find that the timber frame decays round the outside of the infill panel leaving the panel loose in the frame. Many old buildings and structures were built using relatively shallow foundations resulting in seasonal movement as the earth heaved and shrank beneath. If not excessive this was seldom a problem as the building simply moved with the ground leaving almost no evidence of what was happening. I have seen numerous examples of brickwork walls distorted by several inches over a few feet and yet there has been almost no evidence of cracking. 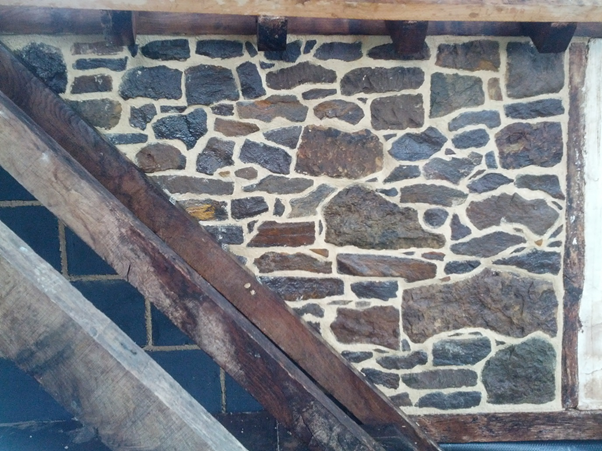 The traditional soft lime mortar over time has accommodated any movement. This has been the way for centuries, however if a modern cement based mortar is used to repair or repoint these old lime built walls this will almost certainly be so ridged that visible cracks and the eventual breaking of the bricks or stonework will be the result. I see a great deal of damage done to historic brickwork by the use of cement pointing where the builder has used cement and mixed a “nice and strong” mix convincing himself and the client that all will be well. A few years of weather later and the brickwork often starts to show the tell tail signs of problems ahead. Often hairline cracks around the bricks may develop, where the adhesion of the cement causes the clay of the brick to fracture or cracks may propagate right through the bricks across many courses. In extreme cases the surface of the bricks can be completely lost leaving the joints with the cement pointing left raised above the now weathered bricks. “Old timers” told me during my apprenticeship that the mortar should always be weaker than the bricks…. how right they were. 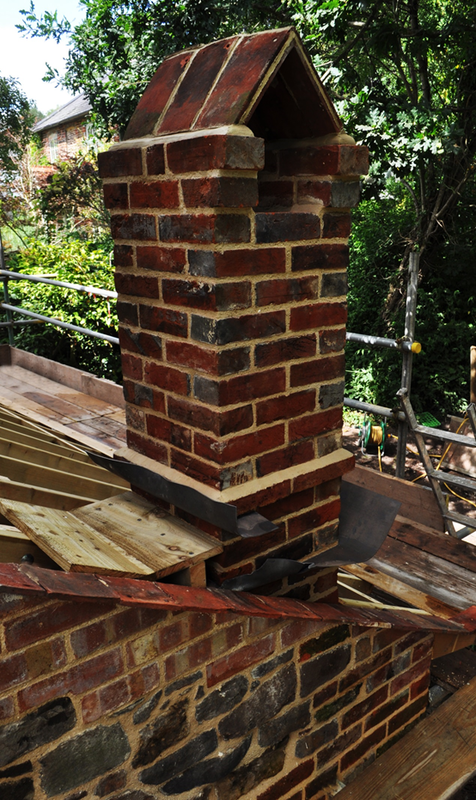 Rebuilt chimney from salvaged bricks, note the rebuilt gable end and the timber support for the new lead backgutter. The current use of lime mortar is mostly confined to the conservation of historic buildings with a relatively small number of new build and self-build projects being completed by enthusiastic individuals. This sets slowly and is used where the masonry is soft or permeable, and in sheltered locations, this also may be used successfully internally and provides the softest mortar of the three hydraulic grades. This could be thought of as a general purpose grade and can be used in most aspects of brick and stonework so long as the exposure is not excessively harsh or the bricks or stone not too soft. This provides compressive strengths suitable for the hardest of materials likely to be encountered. It should be used in the most exposed environments. For example, roofs, chimneys and coastal areas. This is most often sold a s a putty contained in plastic tubs, is creamy white in colour and resembles soft cream cheese in appearance. It is the product of slaked quicklime and therefore is most likely to be the same type of lime used in historic buildings. It sets very slowly by a process of carbonation and therefore requires exposure to the atmosphere to harden. 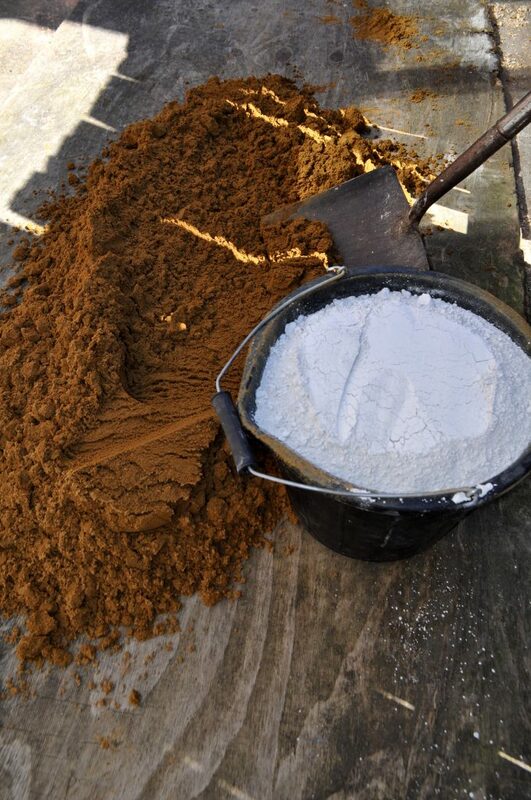 The lime putty should be kept to mature for a minimum of 3 months under a layer of water to prevent carbonation, after this time it can be mixed with aggregates to form mortars and plasters. Non hydraulic lime mortars are relatively soft, set slowly, remain breathable once set and are an absolute joy to use. A wonderful product for the repointing of the soft red brickwork found throughout surrey and sussex. We routinely work with both Hydraulic and Non-Hydraulic lime choosing which is the most appropriate on a case by case basis. When repointing we take a great deal of effort to ensure that we match the colour and texture of the existing mortar as near as possible and tend to gravitate towards the use of non-hydraulic lime for this purpose particularly on soft brick and stonework. 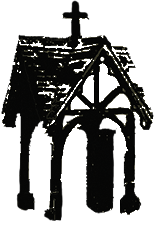 We have rebuilt walls and chimneys where they have been unsuitable for repair and in this situation we may often choose a Hydraulic Lime particularly on chimneys. If the old lime built wall has been pointed with modern cement it can be extremely difficult to remove without damaging the bricks or stone in this situation we would suggest a trial area be set aside to try different techniques to ascertain which may prove the most effective, this along with the type of lime and proposed finish may then may need to be approved by the conservation officer before work commences in full particularly if the building is of listed status. We often find that individual bricks have weathered badly and need replacing this often means sourcing reclaimed bricks to match, when done correctly you should find it difficult to identify the replacement bricks. I’m sure you can imagine from these few paragraphs that the subject of lime and its use in the repair and conservation of historic structures is a vast subject that could easily fill several volumes of text, all the above just scratches the surface if what we have done and can do but I hope it gives an insight into our capabilities. If you need remedial work to your brick or stonework whether that is repairing, repointing or rebuilding feel free to contact us, we have a great many years of experience and knowledge in the repair of masonry structures and would love to help.